Celebrating Our Clients – The AMAZING Russ Bestley! Everybody Pilates loves its clients and we LOVE celebrating them! In the first of our blog posts celebrating our Pilates clients we introduce to you Russ Bestley! Russ Bestley was born in 1962 and has been actively involved in long distance running for most of his life. He works as a Reader in Graphic Design (post-Doctoral researcher and PhD supervisor) at a major university in London. He competed for the Great Britain Under 20 athletics team in the early 1980s and worked voluntarily as a marathon coach with Portsmouth Joggers Club for many years. 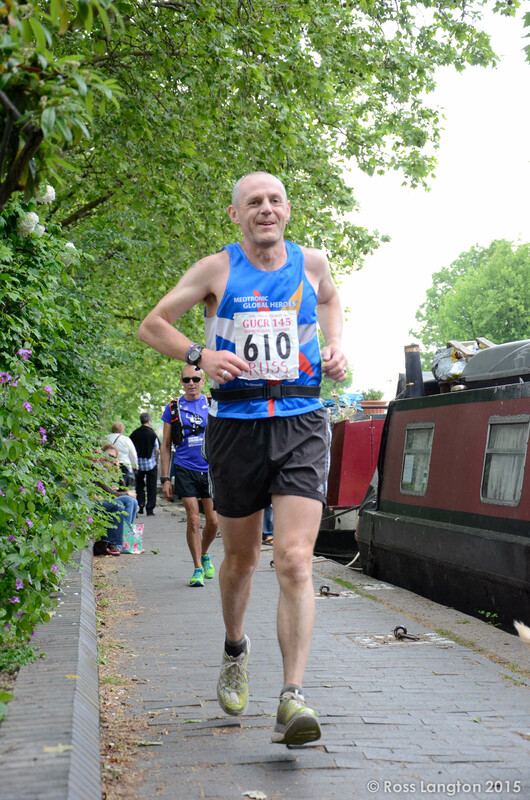 He recently completed his 100th official marathon/ultra marathon at the 145 mile Grand Union Canal Race, and gained entry to the prestigious 100 Marathon Club. He is married to Sarah, who also regularly attends Pilates sessions along with her eldest daughter Zowie and husband Callum. What do you love about Pilates? I love the way that Pilates helps me to strengthen and increase flexibility as a support for my specific sports training. I have been running long distances for a very long time – next year, it will actually be 40 years since I first started competing in cross country events at school, which is more than a little bit scary. I started running marathons regularly in 1996, moving up to shorter ultras (30 miles and 50km) in the early 2000s then longer ultras (50 miles, 100km, 100 miles and beyond) after 2008. With the increased load of much longer training and racing comes increased wear and tear, and repetitive strain types of problems are much more of a risk. In 2013 those problems were becoming more acute for me and I was suffering from some instability issues and weakness in my glutes and lower back, which in turn was causing problems in my quads, knees and achilles. My better half, Sarah, was already going to Pilates classes at Everybody Pilates and encouraged me to come along. I have to say I was unsure at first, but I discovered that the sessions were quite hard, and particularly that I was able to start to focus on specific areas of my body that needed to be worked and which had been neglected through my regular programme (which was based around a typical mixture of running sessions focussing on speed, lactate threshold and endurance, but did little to develop core muscle strength or posture). Since then, Pilates has played a hugely important part in my regular training programme, and I don’t believe I could have achieved what I have without it. What is the biggest lesson practising Pilates has taught you? That sportsmen and women need to look at their whole body development and training, and that a balance of core strength, flexibility and sports-specific training is key to improvement and injury prevention. I have also learnt a bit more about the way that my body works and become more attuned to focussing on specific areas within different exercises. I still have a long way to go there, and sometimes when the pilates instructor tells me to push or pull from some part of my lower abdominals or back I have difficulty locating that muscle group, but I am at least starting to ‘feel’ when I am doing the exercise correctly, and that brain-muscle link takes time to develop and maintain. What would you say to someone who has never tried Pilates? I think some individual consultations or at least small group work is hugely beneficial at first, particularly to get the close attention of the instructor and to ensure that exercises are being done correctly. I do recommend it to other runners as part of their cross training and flexibility programme, and I think those things become especially important as we grow older. I have found that my running style has improved a great deal – I run taller and stronger, and I am able to maintain a decent posture for far longer, which is incredibly important when you are running for 10, 20 or 30 hours in one go. Like everyone I think the answer to this question varies. I like the challenge of some exercises that I find very difficult – the overhead on the reformer has been a bit of a nightmare for me lately, and when I get it right I feel I have really achieved something. I love reformer classes, I do prefer them to mat classes as I get more direct feedback on each exercise from the machines, and I find my control in most of the exercises is better and more focussed. I’d say my favourite exercise is teasers on the reformer – partly because I am generally quite good at them, and I can feel my body working when I do them, so they still present a challenge while at the same time making me feel good that I am at least doing something right! Teasers on the reformer also allow you to sweep your arms deep below your torso (which you can’t do on the mat) and up, so when they are controlled properly you can feel your whole body working in sync. A BIG thanks goes out to Russ … look out for our other amazing clients soon … It could be YOU!!! !